Some supercells are highly electrified and produce copious cloud-to-ground (CG) lightning. These storms are obviously dangerous. However, it only takes one CG to cause a disaster, so every storm should be treated as a lightning hazard. Stay away from fences and overhead lines: lightning can strike relatively far away and travel along the lines. 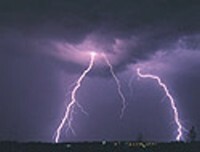 If the time interval between observing the lightning and hearing the thunder is less than five seconds (lightning within one mile), you are in danger and should seek shelter by getting into the vehicle. It appears that CG strikes often occur in regions where precipitation shafts are just opening up, and can occur well away from the precipitation, either in the downstream anvil or upstream of the updraft by several miles. Remember that the best viewing is often at the top of a hill, often near a fence line, and the sometimes, as spotters, you will have all sorts of metal tripods and equipment around you. There is no data or videotape worth risking your life for, so use considerable caution. Ideally, everyone in a spotter position with SKYWARN should know CPR (consult the Tulsa Red Cross for class information): lightning often causes stoppage of breathing and even heartbeat, but CPR can revive such victims successfully in many cases. It is in everyone's best interest to know CPR.